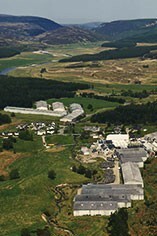 Tomatin has potentially one of the largest Malt Whisky distilling capacities in Scotland although production is currently well below this. The distillery sits some 300 metres above sea level, deep in the heart of the Monadhliath mountains near the Findhorn valley. Soft ripe fruit aromas abound. There is some apple, white chocolate and a distinct smoky edge. The palate develops well to give a swelling tide of easy going fruitiness , some creamy vanilla and a kiss of peat. This is a well balanced and approachable Highlander. Tomatin Distillery (pronounced Tom-at-in) means `Hill of the Juniper' in the Gaelic language. As a distilling site, illicit or otherwise, Tomatin goes back to the 15th Century when drovers - men who `drove' their cattle to market over high mountain passes - would fill up their whisky flasks from a still alongside the Old Laird's House. It was built on the site in 1897 by the Tomatin Spey District Distillery Co.
Its heydays were from 1950s to 1974 that witnessed a steep increase in its production to almost 12 million litres a year, which made Tomatin the largest Scotch whisky distillery in the world in terms of capacity at the time. 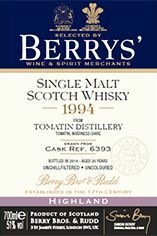 The distillery was acquired by a Japanese venture in 1986, that established the current Tomatin Distillery Company Limited, and launched the modern era of whisky distilling in the Monadhliath Mountains. The whisky is subtle and quite flavoursome. Stylistically it sits mid-way between light, Highland single malts and other richer, lushier Speyside malts.